Can Charlie and Frog find Aggie before it’s too late? Where – and what – is the missing treasure? 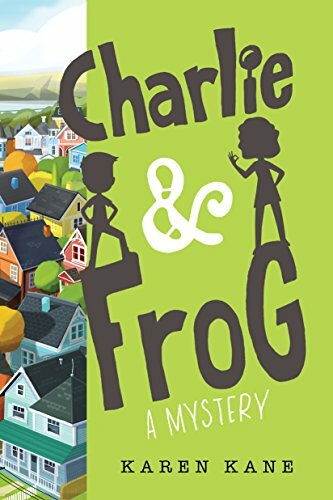 Charlie and Frog: A-Castle-on-the-Hudson Mystery is a whimsical middle-school book reminiscent of Charlie and the Chocolate Factory by Roald Dahl. Its appealing hero flounders manfully to stay afloat in a new town despite absent parents and the negligence of television-addicted grandparents. Caught in the eddies of a cryptic message from a Deaf woman, Charlie follows the lead of an oft-quoted television personality, “good people do good things,” as he unravels the mystery around a Deaf woman fleeing from two strange men. Charlie navigates a maze of environs that include swaying gondolas, disorganized public libraries, and a castle as he discovers friends in unlikely places. The story is chock full of humorous book titles, hidden treasures, sly humor, and great life lessons. Along his journey, Charlie meets Frog, a Deaf girl who teaches him ASL and aids him on his quest through the town rich with Deaf, hard-of-hearing, and bilingual citizens. Keeping his key handy as he joins forces with Frog, her family, and a vocabulary-loving police chief, he follows clues and spends a little quality time teaching his grandparents that listening with the heart teaches more than cooking and crime-solving shows. Throw in a tacturn housekeeper/cook, a quirky librarian, and an ambiguous fortune teller, and Charlie might find he has all the help he needs to turn his fate around. Charlie and Frog is cute, sweet, and engaging while teaching quite a bit about Deaf culture, ASL, and the meaning of family. I think those familiar with ASL will find it fun, while those who don’t yet know ASL will find it fascinating and want to jump in and learn more about ASL and Deaf culture. I’m glad to see that there is a chart of the ASL alphabet at the back, and there are illustrations of key ASL signs throughout the book. These were not available in the Advanced Reader Copy, so very glad to see them here! All Charlie Tickler wants is for his parents to listen. Charlie’s parents have left him (again). This time they are off to South Africa to help giant golden moles. And Charlie? He’s been dumped with his TV-obsessed grandparents. Lonely and curious, Charlie heads into the village of Castle-on-the-Hudson, where a frightened old woman gives him a desperate message—in sign language. When she suddenly disappears, Charlie is determined to find answers. All Francine (aka Frog) Castle wants is to be the world’s greatest detective. Frog, who is Deaf, would rather be solving crimes than working at the Flying Hands Café. When Charlie TIckler walks into the café looking for help, Frog jumps at the chance to tackle a real-life case. Together, Charlie and Frog set out to decipher a series of clues and uncover the truth behind the missing woman’s mysterious message. Charlie needs to learn American Sign Language ( fast) to keep up with quick-witted Frog. And Frog needs to gather her detective know-how (now) to break the case before it’s too late. Discover the surprising ways people listen in debut author Karen Kane’s page-turning mystery filled with humor, intrigue, and heartwarming friendships.